Get the science background you need to master massage therapy! 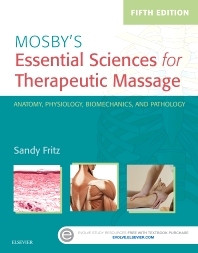 Mosby’s Essential Sciences for Therapeutic Massage, 5th Edition provides full-color, easy-to-read coverage of anatomy and physiology, biomechanics, kinesiology, and pathologic conditions for the entire body. Realistic examples show why you need to learn the information, and exercises and activities help you develop critical thinking skills and prepare for certification exams. All chapters are written by noted educator and massage therapy expert Sandy Fritz, delivering the most up-to-date resource showing how scientific concepts apply to massage therapy practice. Over 700 full-color line drawings and photos show muscle locations, attachments, and actions — required knowledge for passing certification exams and for practicing massage therapy. A workbook/textbook format facilitates study and review with matching exercises, short-answer questions, fill-in-the-blank questions, drawing exercises, and critical thinking questions. Essential content helps you study for and pass certification exams, including the National Certification Exam (NCE), the National Certification Exam for Therapeutic Massage and Bodywork (NCETMB), and the Massage and Bodywork Licensing Examination (MBLEx). Comprehensive coverage of biomechanics includes gait assessment and muscle testing activities along with critical thinking questions. Sections on pathologic conditions include suggestions for referral protocols as well as indications and contraindications for therapeutic massage. Coverage of nutrition explains how nutrition and nutritional products might affect or interfere with massage therapy, describing the basics of nutrition, the digestive process, and all of the main vitamins and minerals and their functions in the body. Learning features include chapter outlines, objectives, summaries, key terms, practical applications, and workbook sections. Learning How to Learn boxes at the beginning of each chapter make it easier to comprehend key concepts. Practical Applications boxes include photos of massage techniques and settings, and help you learn competencies and apply material to real practice. Appendix on diseases/conditions provides a quick reference to indications and contraindications, showing how pathologic conditions may affect the safety and efficacy of therapeutic massage.